First, go to Photopea.com. Press File - Open, and open open your main (background) image. Load another image: Press File - Open & Place. Open your image, and then hit Enter to confirm placing. Make a watermark yourself: E.g. use a Brush or Vector tools to draw a circle or other interesting shapes. Type a text: Use a Type tool to type your own text. 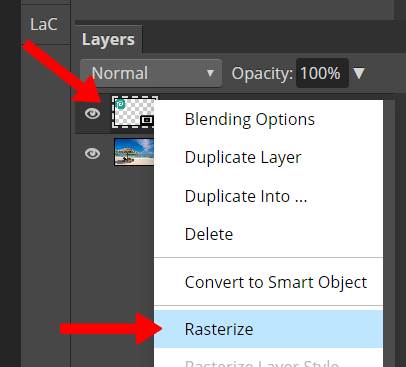 Once we are done, right-click the watermark layer (in Layers panel) and choose Rasterize. Optional: we can also adjust the colors. Press Image - Adjustments - Hue/Saturation. Drag the Lightness to make the watermark completely black or completely white. Confirm with OK.
We may want our watermark to be in the corner of the image, or to be repeated over the whole image as a pattern. To move it to the corner, choose a Move tool (the first in the Toolbar) and drag the watermark to a correct position. You can also use Free Transform to make it bigger or smaller. To repeat the watermark across the whole image, press Filter - Other - Repeat. Here, you can choose many parameters, such as Scale, Row Shift, Spacing, Angle etc. 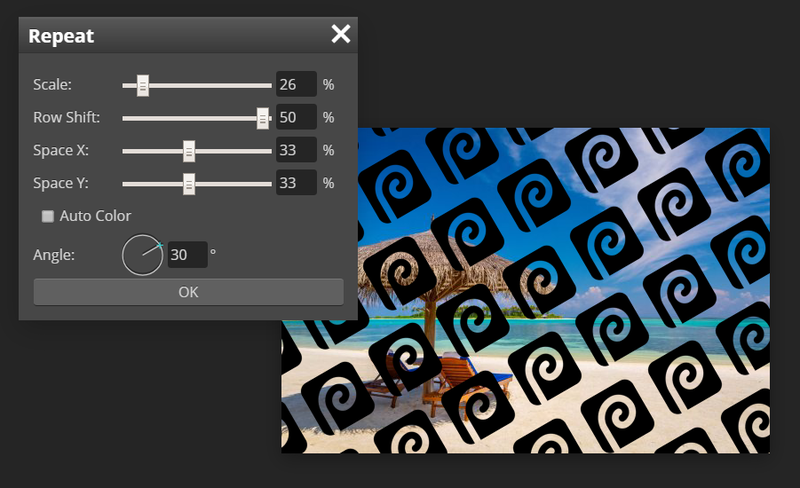 Confirm the filter by pressing OK.
Once we have the right watermark at the right position, we can change the way it interacts with a background. 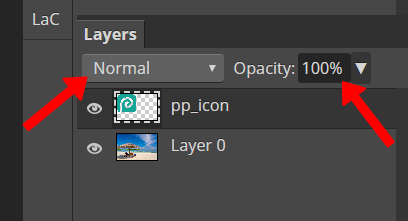 The main two parameters are the Opacity and the Blend Mode, which you can change at the top of the Layers panel. Useful blend modes are Multiply, Screen and Overlay.